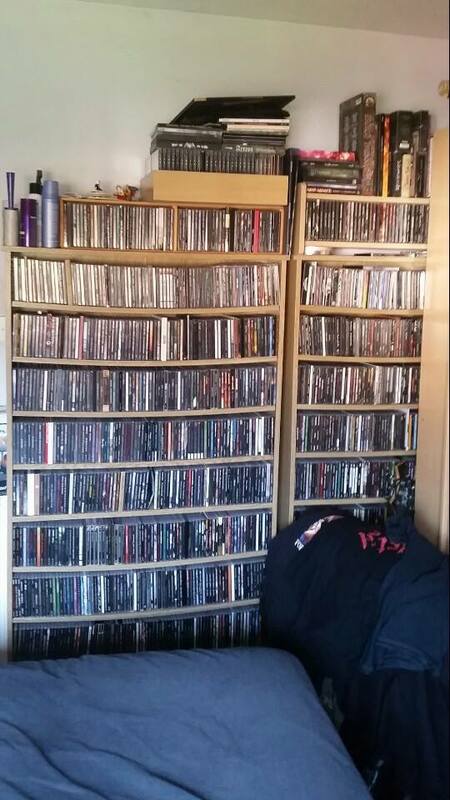 Lars Christiansen is a diehard collector of Metal CDs for several years now. He runs the excellent www.source-of-steel.com , an online collectors â€˜museumâ€™ featuring some of the first presses, most obscure or hard to find releases. He is also a reviewer for www.avenoctum.com and in the past his reviews were also published on www.metalcrypt.com, Metal Team UK (RIP), Golden Lakes Productions (RIP) and Supernal Musicâ€™s Monthly Newsletters (RIP). I suppose it wouldâ€™ve been when I started amassing 100s of CDs in my mid/late-teens. My early days of collecting CDs were pretty sporadic as being a student I had no money. There really wasnâ€™t such a thing as â€˜downloadingâ€™ back in those days, be it legal or illegal, so the majority of my early music came in the form of traded tapes from friends and penpals. I did manage to pick up some original gems from the early 90s, but things never started to get â€˜seriousâ€™ until maybe 95/96. Right now (June 2014) how many items you own and in what formats? 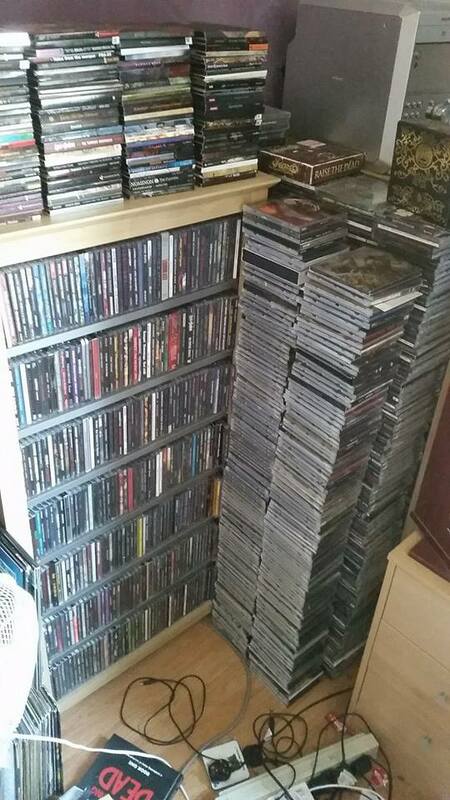 Currently I have just short of 5,500 CDs, less than 50 vinyls, and a stack of old tapes stuck up in an attic somewhere (they probably wonâ€™t be seeing the light of day anytime soon!). I probably get anywhere between 3-10 new CDs a week, so my collection is still growing. Do you collect a specific genre/artist/format/whatever? 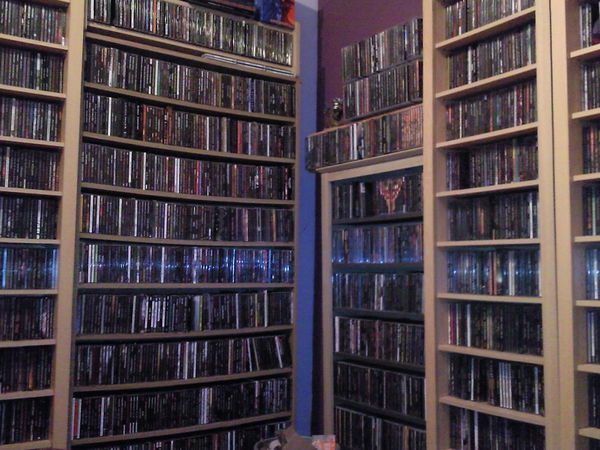 I collect mainly CDs, but theyâ€™re not really bought based around specific artist/genre. Iâ€™m more into the extreme end of metal, so my collection is made up of perhaps 95% Death, Black, Thrash and Doom Metal. When I first started collecting, my knowledge of metal bands was limited to what I read about in magazines, had sent to me from my trading friends, gig flyers, or had seen on other peoples t-shirts. With the advent of the internet, my knowledge (and tastes) grew exponentially (as did my collection!). Is it easy for you to organize and store your collection? How is it organized? Up until around a year ago, my collection was organized perfectly to my liking, all laid out alphabetically by band (then, generally chronologically for each band). However, I eventually ran out of space in my bedroom, so have started to box up certain bits and pieces as there isnâ€™t really room in the rest of the house (particularly with my 2 year old son being interested in shiny things!). I currently have two looming piles of â€˜recently boughtâ€™ and â€˜recently listened toâ€™ CDs which stand in front of my stereo system, as well as an unsorted rack of various other bits and pieces. Itâ€™s not ideal by any stretch of the imagination, but I just donâ€™t have the time to remedy it at the moment (though Iâ€™d love to). Do you keep a file or an index of your items? In what format? What were your first items? I suppose my first items wouldâ€™ve been handed to me by my brother. Metallica â€˜And Justice for Allâ€™ on Vinyl, and Iron Maiden â€˜Number of the Beastâ€™ on cassette tape. I was very young at the time (single figures of age) and thus very impressionable! My brother was an 80s metalhead who listened to the likes of Testament, Skid Row, Motley Crue amongst others â€“ quite a varied bunch. Iron Maiden and Metallica stood out for me amongst his collection, with Maidenâ€™s melodies and Metallicaâ€™s aggression having a double impact on my tastes of which Iâ€™ve never recovered. All are well stocked with decent range, and generally good pricing/shipping costs. What more could a metal head want?! Do you also collect items from artists that you might not like? If so, why? No, who would do that? Seriously, I donâ€™t understand why anybody would do that. Itâ€™d be like some sort of sadistic self torture! :) I only collect things I want to listen to. Iâ€™m not one of those collectors who will buy something just to keep so it can be â€˜sold onâ€™ for a profit at a later date, or to keep fingerprint/dust free so it â€˜doesnâ€™t lose its valueâ€™. If youâ€™re not buying to use and enjoy the music, youâ€™re collecting for the wrong reasons as far as Iâ€™m concerned. I have bought stuff which Iâ€™ve grown out of, or grew tired of, but generally these get sold on to a new home! Do you also download music? Or you keep it only physical? Iâ€™m not interested in paying for digital music by itself. I use digital downloads for reviewing music and am happy to download stuff to my phone from bandcamp etc, when the digital music comes free with a purchase of the physical release. I donâ€™t know, but I always feel like something is missing with digital music. I guess Iâ€™m not a child of the digital generation who argue that only the music is important. Of course it is, but I grew up with the physical package where the music was just one part of the â€˜piece of artâ€™. The artwork, the liner notes, the photos â€“ the full package. I feel that people who only have digital music miss out on all that. What would you say is the "driving forceâ€ behind your collecting hobby? Do you have to have it? Is it â€“somehow- a part of yourself and you must own it? How do you analyze it in psychological terms? Interesting question; I canâ€™t say Iâ€™ve ever put much thought to it! Back in my earlier days of collecting, I was very much of the frame of mind that I had to have everything, buying every new release I wanted the moment it hit the shelves, scouring bargain bins for obscure strangeness and buying blind purchases based off artwork alone â€“ crazy huh? These days, I am a lot more discerning. If I hear an album from a band I like is getting mediocre reviews, Iâ€™ll try before I buy â€“ standard fare for most people. I generally like deluxe editions when buying new releases, as the bonus content for a few pounds more are generally worth it in my opinion. However, I also like to collect first presses of older releases â€“ but not for crazy money. I donâ€™t like paying eBay prices for things at all. Any idiot with a ton of cash can build an impressive collection with thousands of dollars wasted on eBay scalpers â€“ but what fun is that? The thrill is a thousand times better finding a dusty super rarity laying in a 2nd hand shop bargain bin. Any regrets of an item you sold in the past that you shouldnâ€™t? Yeah, many that Iâ€™d ended up selling actually â€“ very annoying. I went through a phase perhaps 10 years ago of selling my original presses when re-issues came out. I ended up getting rid of the first three Atheist albums in their original pressings for the Relapse re-issues. Years later, I ended up buying the originals back again, so now I have both sets of issues! This has been the same for a few other releases too. However, one biggie which I majorly regret was parting with the original CD pressing of Demoncyâ€™s â€˜Faustian Dawnâ€™. I will never live that down â€“ what an idiot! Did you ever bought an item you already had because you couldnâ€™t remember if you got it or not? Embarrassingly I have â€“ twice! However, both times it was because the album had been re-issued with different artwork, and I thought upon seeing it that it was a new album which had flown under my radar. So I guess in a way itâ€™s forgivable. Usually Iâ€™m pretty good for knowing exactly what I have in my collection, but my memory can only stretch so far when it comes to the more obscure album titles! What would you say are the most valuable items in your collection? Are we talking in terms of valuable to me personally (i.e, my favourite albums), or valuable in terms of eBay prices? :) Iâ€™d struggle to nail down to even 50 of my favourite albums â€“ but one which I generally always claim to be my all time favourite is Carcass â€˜Necroticismâ€™. That album is one which I will never grow tired of. In terms of â€˜monetaryâ€™ value, Iâ€™m not really sure â€“ itâ€™s hard to tell because â€˜market valueâ€™ always seems to fluctuate wildly, wholly dependent on who wants what and when. I guess some of my Drowned Productions CDs would gain a pretty penny, Miseryâ€™s â€˜A Necessary Evilâ€™ on Velvet Urge or the very first press of Inquisitionâ€™s â€˜Into the Infernal Regionsâ€¦â€™ on Sylphorium Records. Do you also have a want-list? How many items does it have? Yeah I have quite a hefty want list. It probably has 500-600 titles on it at any one time. Generally once I hear of a band about to release an album Iâ€™m interested in, Iâ€™ll stick it straight onto my want list (unless itâ€™s a release which Iâ€™m super pumped for, in which case Iâ€™ll generally order it straight away). Yep, I have a wife and a 2 year old son. My wife is into a small amount of metal stuff, so I will discuss some bits with her, but itâ€™s not really as much her passion as it is mine. She is very understanding with me taking over the house with my collection, and I know Iâ€™m very lucky! I try not to let my son near my collection, as at his age heâ€™s very into picking things up and wrecking them â€“ if he were to get his hands on my collection, half of it would probably be destroyed in a matter of minutes! :) However, Iâ€™m happy for my wife to help herself to an album to listen to when she feels like it â€“ sheâ€™s very careful! Remember the days before the internet? I am sure you must have been kind of more thrilled when discovering new musicâ€¦ and what a chase was to find more information about records no one else ever heard ofâ€¦. Yes, I am mid-thirties so do indeed remember the non-internet days very well. The thrill of discovering back then is still the same as it is today, but these days â€“ everything is so much more plentiful, so you have to be much more discerning. In the early 90s and before, if you bought an album â€“ you might not have heard a single thing on it before putting it in your stereo. If it sucked upon first listen, you damn well persevered and listened until it either sucked harder, or it grew on you. These days, due to the disposable nature of downloading, I donâ€™t think a lot of people are likely to give things a second chance if it isnâ€™t instantly gratifying which is a huge shame. What would you like to happen to your collection when you will leave this world? Itâ€™ll likely be inherited by the rest of my family. Iâ€™ll be sure to highlight the best stuff to check out first! Thanks a lot for the interview; it was a blast to chat about my passion to a likeminded individual! Please check out my collectorâ€™s website at www.source-of-steel.com for pictures of the gems from my collection!